VAIL. The name says it all. Its a magnificent mountain in the heart of the Rockies, the BIGGEST mountain in the United States. It is so big that its seven back bowls are more than six miles wide! The resort encompasses more than 4,600 acres, but the statistics cant tell you the whole story. This is one ski hill you need to taste for yourself. There is no lack of sensory stimuli here. There are runs...more than 174 of them...that can take your skiing to new heights. And the powder--often chest deep, and so light--skis brush right through it. This is the place I skied thigh-deep powder in my slalom skis. This is the place I dream about when the first snowflakes fall. Vail Photo: Jack Affleck Theres nothing better than skiing the untracked, avoiding crowds, and having the sun warm you for most of the day. Vail is so vast that in a days worth of skiing you will only sample a fraction of her terrain. But here is a strategy to get you up on top and keep your skis in champagne snow. Vails lifts open at 8:30 a.m., but get there early to purchase your ticket. Your game plan is to get up to Game Creek Bowl and carve your signature on a fresh palette. You will find the Cascade Village Lift to be uncrowded in the morning; most skiers are accessing the mountain by way of the Vista Bahn Express or the Eagle Bahn Express Gondola (formerly Lionshead Gondola). Hop off and ride the Pride Express Lift, then the Game Creek Express Lift. Take a warm-up on Showboat and get your knees pumping on Deuces Wild or Ouzo. It's probably time to get on the move because the crowds are starting to arrive. Hop onto the Game Creek Express Lift for a final ride to the top. You will find yourself at the Wildwood Shelter, where you are ready to drop into the back bowls. Traverse down Ptarmigan Ridge and choose either Rickys Ridge or Widges Ridge for that first run in the morning sunlight. The High Noon Lift will bring you back to the top where you can dance in the fluff of Sun Up Bowl. You can get up a nice rhythm on Cows Face and Campbells; skiing Sun Up Bowl until the crowds catch up with you. Take the Sun Up Lift and follow the sun into China Bowl, where some more friendly runs await you. The majority of trails in the Back Bowls are recommended for Advanced Skiers; but West and Poppyfields, intermediate runs, can even be enjoyed by experts. They are a more relaxed way down and a brief respite before your next "bowl game." Take the Orient Express Lift to the top and head into Siberia Bowl. Gorky Park will give your thighs a power workout, and if you want to sample the fine powder in the trees, Bolshoi Ballroom will keep your skis dancing. Its time to head into lunch, and the Two Elk Lodge is waiting for you at the top of the Orient Express Lift. Here you can enjoy a great view of China Bowl while feasting on Southwestern soups and stews, fresh salads, pastas and pizzas. Your morning rush is over and its time to head to the front side of Vail. From the restaurant, ski down Highline if you want a double-diamond dose of adrenaline. Want to get into the afternoon skiing a little more slowly? Whiskey Jack to the Northwoods Express Lift, then down the tree-lined runs of Expresso and Cappuccino will warm you up for some more serious adventures. 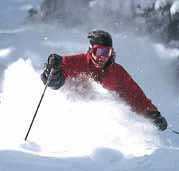 Below Mid Vail are some great runs to round out your day. Giant Steps and International can get bumped-out by the end of the afternoon, so if you want a mogul challenge, these runs parallel the Giant Steps Lift. You havent even seen half of what this mountain has to offer, but I want to keep some mystery and leave places for you to explore. 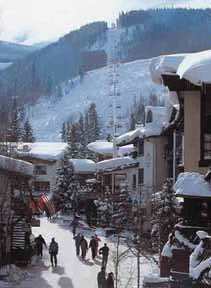 Vail Photo: Dann Coffey Heading off the slopes, you are greeted to one of the most charming pedestrian villages to grace a mountain. In 1965 Vails famous landmarks, The Clock Tower and Covered Bridge, were constructed--giving Vail a quintessential flavor and architectural style of a Bavarian Village. Tiny white tree lights shimmer in the night, adding to the ambiance. Along Bridge and Wall Streets there are stores that will let you shop 'til you drop. Art galleries feature items from jewels to blown glass. 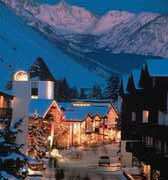 There are boutique and clothing stores, ski and snowboard shops. For the food connoisseur, Vail offers a rich variety. At Lancelots, you can feast on the Knights Cut of Prime Rib, or the Fresh Catch of the Day. Sweet Basil has an appetizer menu that rivals the variety of runs found on the mountain. From portobello mushrooms to curried crabcakes, when your stomach grumbles after a day of skiing, this is the place to quiet your cravings. If all this apr�s skiing activities still finds you standing, there is more nightlife to be found. On Bridge Street, Nicks is a popular dance club and a great place to meet people. In Crossroads Center, ear pleasing sounds of live bands can be enjoyed at Gartons Saloon. For a more mellow evening, Mickeys in the Lodge at Vail and The Kings Club in the Sonnenalp Resort are top-notch piano bars. To get your legs in shape for another day on the slope, sample Sheikas nightclub for some underground dance music. In the nearby town of Avon, Cassidys Hole in the Wall has line dancing and live entertainment. Vail. Its a great place to spend a winter ski respite. You can cross-country ski, tube, bobsled, ice skate, and even Snowbike (a mountain bike on skis) right on the mountain. Catch a birds-eye view of the Vail Valley from a hot air balloon ride and float gracefully over the ski runs. Isnt it time you decided to meet the mountain? Click here to plan your own trip to Vail, Colorado!